What is the well-dressed Sufi wearing at Dance Camp? It was all good stuff, even when it was raining sideways! One of the things I realised, once I got there, was that I’d brought totally the wrong kind of clothing. OK, I had the waterproof coat, plastic overtrousers, thermal socks, and so on (after all, this is ENGLAND in the summer 🙂 ), but one thing I didn’t have was ‘suitable’ wellies. I had remembered to bring my boring old navy blue gardening wellies (‘just in case’, ha ha) – and I ended up wearing them for most of the week – even INSIDE the tent, sometimes (I kid you not). However, I noticed that many of the other women were wearing the lovely, brightly coloured wellies that are available now, to go with their bright and jazzy clothes. That made my boring old blue ones seem even more…well, boring. So, to buy wellies in small sizes is not easy. My husband has no supplier to try. No online (or offline, for that matter) shoe shop sells adult wellies in a small size – there’s just not enough of a market. Still, I thought, if it’s jazzy patterned wellies that I want, children’s ones will do fine. They’ll be a bit short in the leg, but that’s OK. I started looking by doing a Google image search, and couldn’t believe my luck. Now, for people who don’t know, the Sufi ’emblem’ is a heart with wings, and many people who do Dances of Universal Peace, such as me, are following the Sufi spiritual path. So, when I came across these Western Chief cowgirl wellies, I was really pleased! They might not have been designed specifically with Sufis in mind, but the logo on these definitely looks like the Sufi one to me! Western Chief cowgirl wellies, with what looks like the Sufi emblem, to me! Author Janet GrangerPosted on October 21, 2009 March 5, 2012 Categories Dances of Universal Peace, SufiTags Dances of Universal Peace, Spirituality, SufiLeave a comment on What is the well-dressed Sufi wearing at Dance Camp? Finished embroidery – look at this beautiful doll’s house embroidery stitched by my customers! Sue from Berkshire owns this beautiful house, and has been making the soft furnishings for it for several years. The house was lovingly made by her father, with great attention to detail. This cosy bedroom features the needlepoint carpet called ‘Carole (pastel)’. It measures about 8 inches by 5. The wallhanging to the left is based on the William Morris tapestry ‘Orange Tree’, and measures almost four inches square. It is stitched in Anchor stranded cotton. The carpet is stitched in Appleton’s crewel wool. Janet B from Birmingham is a very keen stitcher, and owns several doll’s houses. Here is a picture of the bedroom in one of her doll’s houses. Isn’t the teddy cute? The most recent photo I’ve had sent to me is from Susan C. She made a ‘hobby room box’, in contemporary style, and filled it with miniature versions of the hobbies that she enjoys – such as miniatures (obviously! ), knitting and using her computer. She used one of my chart packs to create her own colourway of one of my carpet designs (this one is called ‘Josie’). I think it’s come out beautifully, and really sets off the room. Aren’t my customers a talented bunch?! Author Janet GrangerPosted on October 16, 2009 March 5, 2012 Categories Room settings & collectionsTags Doll's house, Doll's house embroidery, Dollhouse, Embroidery, Finished embroidery, Hand embroidery, Miniature needlepoint3 Comments on Finished embroidery – look at this beautiful doll’s house embroidery stitched by my customers! These miniature embroidery pieces were designed and stitched by me over several years, but I always had in mind right from the beginning the idea to create a co-ordinating set of stitched pieces in gold and red tones. To give you an idea of the scale (which is the standard collector’s scale of what’s called ‘one twelfth’, by the way) – the cushion measures an inch and a quarter across, the firescreen is two and three quarters high, and the carpet is six and a half inches wide. The carpet is based on a ‘real’ one, in the Aubusson style, and stitched with Appleton’s crewel wool on 18 count canvas. 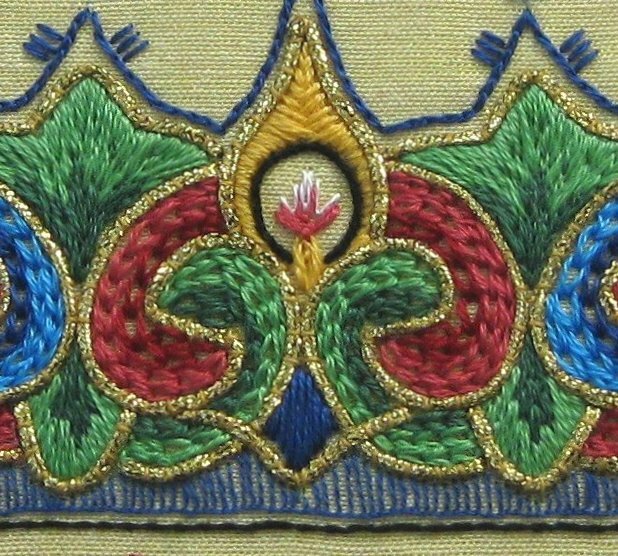 I then took motifs from that, and designed a matching bellpull on 32 count silk gauze (stitched with one strand of Anchor cotton), and the firescreen appeared soon after. All are available as kits from my website except for the footstool.